Slow Food USA: You also traveled to the South of France to work with a baker who grew his own ancient grains, and to Berlin to focus on whole grain breads. Did those experiences change the way you bake at home? They did. Learning at the elbow of a master makes a difference. But I would say, it wasn’t simply European bakers who provided tips. I worked at places like Tartine Bakery in San Francisco, Little T American Baker in Portland, Oregon, and Della Fattoria in Petaluma, California and with a world class solo baker in Sonoma, Mike Zakowski. Bakers at all these places taught me techniques that I adapted into my home baking. I think we have this conception that the Europeans are really ahead when it comes to bread, but I don’t think that’s the case today. There’s a lot of exchange between European and American bakers and recognition of how far bread baking has come in the US. In some cases, I’d say the US is ahead because we’re not bound by tradition. We can borrow and mix and match to come up with our own ideas of what great bread should be. Slow Food USA: The beginning of the book focuses on more classic loaves like the baguette and then as the book progresses it turns more brown—that is, you add more grains into the loaf until the last chapter, you’re baking with organic whole grain flour from a small farm in Maryland. Was that by design? It really followed my own trajectory. White flour has been designed from seed-to-mill to be very consistent. But I’ve come to view the sweet, delicate quality of white bread loaves as more of a treat than daily sustenance. I find loaves made with whole grains, with rye or whole wheat or even buckwheat, fermented with sourdough, to be much more satisfying. In Berlin, a baker told me he ate just one slice of whole grain bread in the morning for breakfast because it was so substantial and burned so slowly—that is, the bread digested over time. Nutrition studies bear this out, plus there are the substantial health benefits from eating whole grains, as we know. But whole and especially local grains can be less predictable than white flour, so it requires more craft and attention from the baker to make a loaf that isn’t a brick. You need to coax a loaf, and ultimately unleash the flavor locked in the grain. And that’s what’s exciting. I think we’re discovering or rediscovering tastes and textures that have long been absent from the palate, or at least since white flour began to dominate with the age of industrial milling. Slow Food USA: So you’re going backward to the way people used to eat? In part, I am. By using sourdough, which relies on wild yeast and bacteria and working with single varieties of locally grown grains, it does in a sense mimic what bakers used to do—make loaves from the wheat and other cereal grains they grew in nearby fields and baked in village ovens. But there’s a real important difference. I am doing this by choice. All those wonderful and varied loaves that people made in the pre-modern world, with nuts or grains like millet or chickpeas, were the result of necessity. People baked with those ingredients because the supply of wheat was variable. Today we do have enough wheat, at least in the wealthier parts of the world, and we have the luxury to use other ingredients. And it’s a good choice, because with whole grains at least, we’re using the entire kernel, rather than leaving 30-40 percent of it as a waste product for animal feed, as is the case with white flour. If the world ate whole grains, the supply of food would rise sharply. That’s because wheat provides the second largest source of calories in the world and is the top source of humanity’s protein and yet we’re wasting a lot of this sustenance. Slow Food USA: Really? Wheat is top source of protein that now everyone, it seems, is trying to avoid? Well, gluten-free is a choice of modern life in richer countries of the world. A small number of people must avoid gluten due to celiac disease—about 1 percent of the population—and another small portion appear to have gluten intolerance issues. But a large number of people are choosing to avoid gluten by choice rather than medical reasons. For most people in the world who depend on wheat for sustenance that simply isn’t a choice. Wheat is food. Slow Food USA: So you’re obviously not buying into the Paleo diet? In one chapter of the book, I deal with the earliest archeological evidence of why people started eating grains. It began with nomads harvesting wild grain in the Fertile Crescent. It might have been spurred by a desire for beer, since wine made from fermented fruit was seasonal. Grain could be stored. It may have also stemmed from communal religious gatherings. Plus grains were a good source of stored calories that wouldn’t spoil. So our ancestors chose to give up the nomadic life of hunting and gathering, and eat grains and legumes, and domesticate livestock instead. And something else happened as well. Our bodies actually developed the ability, through an enzyme known as amylase, to process the starch within grains and its inherent calories. This genetic adaptation is more prevalent among people who historically have eaten grain. In other words, we have genetically adapted to eating grain based foods. The problem—and here’s where I agree with the Paleo folks—is with consuming all the heavily refined foods that can lead to a host of diseases, such as obesity. Slow Food USA: Getting back to the bread, do you have the ideal recipe for the beginner? Well, I make clear this isn’t a recipe book, though I do offer several recipes. I also offer tips for and book recommendations for beginning bakers. 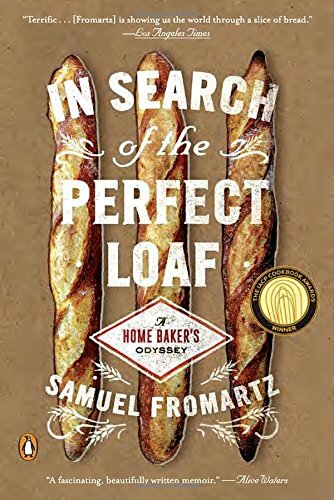 But I take more of an expansive view of bread in this book and try to explain, within this travel narrative, what bread is and the principles to make it. Bread making is all about technique and tactile feel—I really believe the recipe determines about 10 percent of success. The rest comes from the techniques and principles I explain. In part, the reason I wrote this is that I wanted to articulate these principles for myself. I had questions I wanted answered. Writing the book was a way of answering them. Slow Food USA: And did you find the perfect loaf? No, and isn’t that the point? Jim Lahey, a great baker who owns Sullivan Street Bakery in New York, told me that the perfect loaf doesn’t exist. I’d have to agree and that’s what makes this craft so fun.